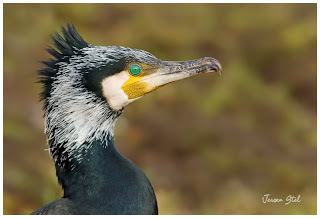 What allways strikes me the most when photographing Great Cormorants (Phalacrocorax carbo) is their amazing green eyes. They seem to pierce right trough you and with those bright eyes, funky crest and dark but gorgeous plumage they are great fun to capture. Not the easiest species to get a good shot of though as they are quite skittish when approached. This one let me get close to him when i was driving his way with my car and allowed me some portrait shots showing that bright green eye well. 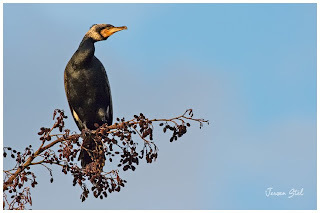 Later that afternoon just before the sunset i found one of his cousins perched up in a tree and was able to get some more shots op this lovely species.